Survey respondents in Germany display a quite strong aversion to granting trade credit to business-to-business (B2B) customers. On average, 28.9% of the total value of respondents’ B2B sales were transacted on credit terms (average for Western Europe: 41.2%). This does not differ significantly from what was observed last year, and is similar to the practices of respondents in Austria, Switzerland, Belgium and France. Respondents in these countries reported an average of 30% or less of their B2B sales value made on credit over the past year. German respondents seem to be almost equally likely to grant trade credit to domestic or foreign B2B customers. 29.9% and 25.6% of the total value of domestic and foreign B2B sales respectively were made on credit terms (survey averages: 44.8% domestic and 37.7% foreign). This reflects an almost uniform perception of payment risk arising from either domestic or foreign B2B trade. 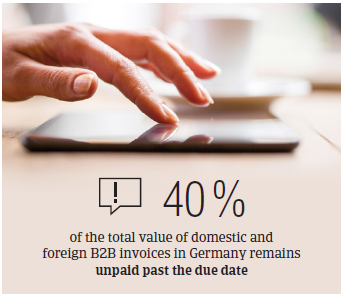 An average of 40% of the total value of the B2B invoices issued by respondents in Germany remained unpaid at the due date. This is in line with the survey average. Over the past year, late payment of invoices has not changed significantly. In addition, they occur almost equally often with domestic and foreign customers. Invoice late payment (domestic and foreign) is reflected in the Days Sales Outstanding (DSO) figure posted by German respondents. This averages 33 days (three days longer than last year), the second lowest in Western Europe (after that of Denmark), and is markedly below the 48 days average of Western Europe. This may reflect greater efficiency in collecting high value long outstanding invoices than in most other Western European markets. 63.8% of respondents in Germany (in line with the response rate in Western Europe) expect no change, and a sizeable 25.8% expect an increase in DSO over the next 12 months. This may explain why more respondents in Germany (13.4%) than in Western Europe (11.9%) consider collection of outstanding invoices to be the biggest challenge to profitability in 2016. This, along with cost containment (27.3% of respondents compared to 23.4% for Western Europe) concerns respondents the most. Payment terms extended to B2B customers by respondents in Germany are the shortest observed in Western Europe. They average around 20 days from the invoice date, for both domestic and foreign customers (survey average: 31 days). Compared to last year, these payment terms did not vary significantly. Similarly to in Austria, this reflects a payment culture that places a very strong emphasis on swift invoice payment, as that seen in Austria. Despite very strict payment terms, a staggering percentage of respondents in Germany (93.0%) experienced late payment of invoices by B2B customers over the past year. This compares to 88.5% of respondents in Western Europe. 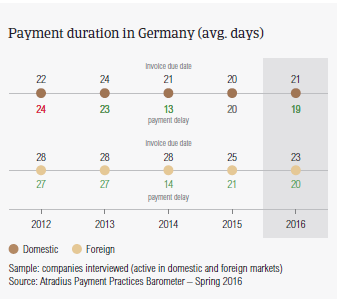 Although payment terms did not vary year-on-year, German respondents had to wait an average of three weeks past the invoice due date for overdue invoices to be paid. This is in line with the survey average. This means that it takes German respondents an average of 40 days from invoicing to convert overdue B2B receivables into cash (survey average: 53 days). This is in line with what was recorded in Austria, Sweden, Denmark and the Netherlands. 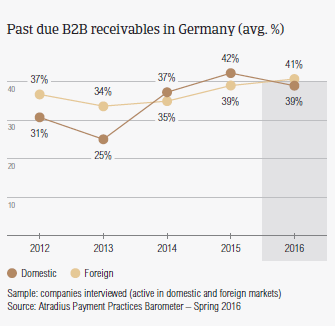 Liquidity issues of the customer is the reason for late payment of domestic and foreign B2B invoices most often reported by German respondents. More respondents (45.6%) than last year (39.5%) reported this in respect to late payment from foreign customers. Late payment of domestic invoices due to the same reason in contrast, was reported less often than one year ago (50.5% of respondents compared to 55.0% last year). Customers’ intentional use of outstanding invoices for financial advantage is the second most frequently cited reason for late payment by respondents in Germany (around 30.0%). Payment delays due to this reason, however, appear to occur significantly less often than one year ago. Regardless of the reason for late payment, as a result of it, many of the survey respondents had to postpone their payments to their own suppliers (nearly 23.0% of respondents) and experienced a loss of revenues (20% of respondents). This is in line with the average response rate in Western Europe. To protect business profitability against payment default arising from B2B trade on credit, 40.0% of the respondents will check their customers’ creditworthiness and review track records more often over the next 12 months. Around 35.0% will increase monitoring of their customers’ credit risk. This is in line with the average responses in Western Europe. The proportion of B2B receivables reported by German respondents as uncollectable (0.8%) is notably lower than the 1.3% average for Western Europe. Domestic uncollectable receivables were written off almost as often as foreign ones. Uncollectable domestic B2B receivables originate most often from the chemical, construction, consumer durables and business services sectors. 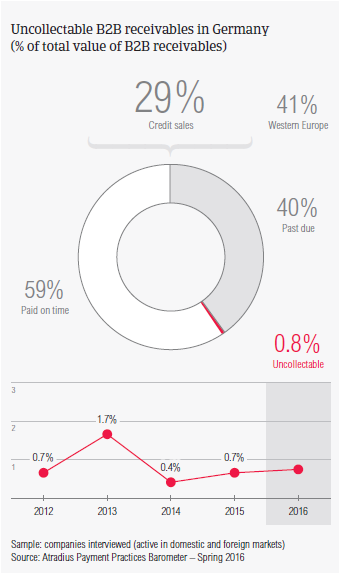 For most of the respondents in Germany (61.5% compared to 59.3% in Western Europe), B2B receivables were uncollectable mainly due to the customer being bankrupt or out of business. 26.5% of respondents reported that write-offs were due to the failure of the collections attempts, as well as the high cost of pursuing the trade debtors. 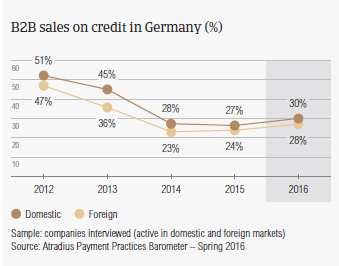 Survey respondents in Germany reported granting trade credit terms mainly to B2B customers belonging to the consumer durables, chemicals, construction, financial services, machines, metals, business services and services industries. Notably longer than average (for the country) invoice payment terms are extended to B2B customers in the machines industry (averaging 33 days from invoicing). The construction industry generated an above average (for the country) proportion of overdue invoices. According to most of the respondents (58%) this is likely to be chiefly due to B2B customers from this industry deliberately using outstanding invoices for financial advantage. A higher than country average level of overdue invoices was also recorded in the machines sector. This was mainly due to B2B customers claiming insufficient availability of funds (reported by 45% of respondents in Germany). 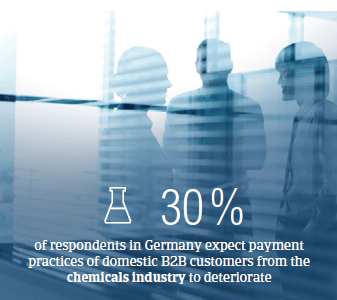 Around 30% of the respondents in Germany expect payment practices of B2B customers in the chemicals, construction and metals industries to deteriorate slightly over the coming months. No significant change is anticipated in the payment practices of other industries.